Learn the key points of doing a handstand, both at the wall and in the center of the room. When you're ready, try the classes below that incorporate your handstand into a complete practice! Builds muscles in the chest, shoulders, triceps and core. Increases spatial awareness and balance. Good weight-bearing for wrist, hand and finger bones. Helps to look at the world from a different perspective, and face your fear of falling. Start in down dog, hands an inch or so away from the wall. Hands are shoulders’ distance apart, creases of the wrists are parallel to the front edge of your mat. Bend a knee and step one foot forward a enough that you can lean forward, so the shoulders are over the palms of your hands. Wrap the outer arms back, so you feel that your upper back is broad, and keep your shoulder blades on your back. Keep your arms straight, and your shoulders plugged into the shoulder sockets. Draw your navel in, lift the pelvic floor, and spin your inner thighs toward the wall or the space behind you. Try to stand on the ceiling with your feet. Here are some classes featuring Handstand. This class has just enough movement to help you breathe through any stress that you need to rid yourself of so you can find your Groove! There are plenty of options to arm balance and get upside down if thats what you need. And of course we have some invigorating backbends and some juicy hip openers to make this a well rounded and super fun class! 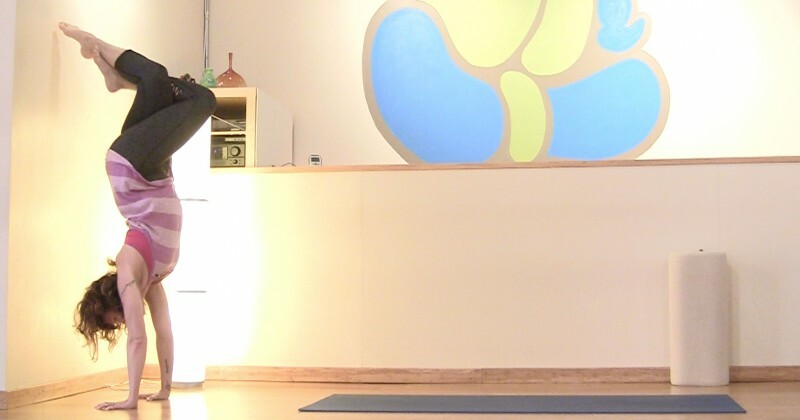 In this super charged full body flow you will be challenged and motivated to try some new transitions and fun sequencing. I encourage you to breathe your way through the tough spots to help you move into the poses with ease and grace.